InterCity Coachlines operates the largest national bus and coach network within New Zealand, transporting international visitors and kiwis around New Zealand for more than 30 years. Traveling by InterCity Coachlines is a safe and eco-friendly way to see and explore New Zealand's scenery and geographical regions. With a range of fares starting from NZ$1.00 and over 130 daily services to choose from, you can travel to 500 towns, cities, major skifields, national parks and major tourist attractions through out New Zealand, including destinations on the route map, in modern eco-friendly, air-conditioned buses and coaches with reclining seats with foot and head rests. All InterCity buses and coaches have seamless 3G and 4G mobile Wi-Fi access across all InterCity regional and long distance routes within New Zealand. 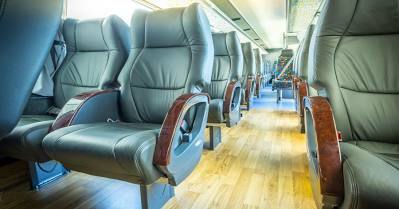 InterCity Coachlines regional buses and long distance coaches do not have onboard toilets facilities but do make regular stops for refreshment and comfort breaks on route. InterCity Link provides regular bus services to smaller regional settlements and towns in association with local bus operators. InterCity Coachlines operates the Starlighter overnight coach services between Wellington, Palmerston North, Taupo, Rotorua, Hamilton and Auckland or vice versa. This service connects with Cook Strait ferry services operating between Wellington and Picton. The Starlighter overnight coach services features reclining seats with foot and head rests, individual reading lights and air-conditioning controls, onboard toilet/washroom facility and makes three refreshment/comfort stops on route. For stress free relaxing travel, InterCity Coachlines GOLD seats - soft leather reclining seats with head and foot rests and individual USB charging ports, are located on the Auckland to Wellington daytime and on the lower deck of the Auckland to Hamilton, Rotorua, Taupo, Palmerston North and Wellington Starlighter overnight double decker coach services, the first 3 rows on the single deck coach services between Wellington to Palmerston North, Hastings and Napier, Christchurch to Kaikoura, Blenheim and Picton, Christchurch to Dunedin and Dunedin to Queenstown coach services. These seats provide plenty of room to stretch your legs. Simply lie back and relax – plug in your USB, log on to the WiFi. The best thing is, they don't cost a lot more than the regular fare! With InterCity Coachlines Fare/Reservation, you can search online for times, destinations, fares, check seat availability and make instant confirmation reservations for all InterCity bus and coach and inter-island ferry services through out New Zealand by using the Fare/Reservation search box, located on the left. InterCity Coachlines is identified as 'IC' and InterCity Link as 'IL'. InterCity Coachlines services from Nelson Westport, Punakaiki, Hokitika, Franz Josef and Fox Glacier, connects with the famous TranzAlpine train service to and from Christchurch, Arthurs Pass and Greymouth. Reservations for the TranzAlpine train to and from these destinations as combined coach and train travel, can be made using the Fare/Reservation box, located top left of the page. You can make reservations to and from Auckland International Airport to Auckland city and most North Island destinations outside of the greater Auckland urban region, either from the International or domestic terminals, to other North Island destinations, including combined coach and inter-island ferry travel from Auckland to Nelson, Blenheim, Kaikoura and Christchurch. Using the Fare/Reservation box, located top left, type or select 'From' either 'Auckland International Airport' or 'Auckland Domestic Airport' and 'To' the destination you want to travel to. Reservations for drop off at Christchurch International Airport on InterCity northbound services from Invercargill, Te Anau, Timaru, Oamaru, Ashburton, Dunedin and Queenstown to Christchurch can be made, by typing or selecting 'Christchurch Airport' in 'To', field of the Fare/Reservation search box. If travelling on an Interislander ferry sailing between from Wellington and Picton, using the Fare/Reservation box, located on the left - type or select 'Wellington Central' in the 'From' field and type or select 'Picton' in the 'To' field as your destination. If travelling from Picton to Wellington - type or select 'Picton' in the 'From' field and type or select 'Wellington Central ' in the 'To' field as your destination. For travel from Wellington to Blenheim, Kaikoura, Christchurch or Nelson, using the Fare/Reservation box - type or select 'Wellington Central' in the 'From' field and type or select 'Blenheim, Kaikoura, Christchurch or Nelson' in the 'To' field as your destination. For travel from Blenheim, Kaikoura, Christchurch or Nelson to Wellington - type or select 'Christchurch, Blenheim, Kaikoura or Nelson' in the 'From' field and type or select 'Wellington Central' in the 'To' field as your destination. You can book accommodation that is near to long distance coach terminals in Auckland, Paihia, Rotorua, Wellington, Nelson, Christchurch and Queenstown and near Franz Josef and Fox Glacier coach stops and near the Christchurch railway station for the TranzAlpine train. Bus and coach services to and from Auckland and Christchurch international airports are also available. 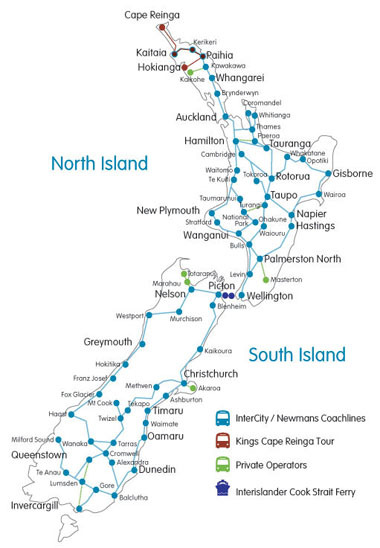 You can travel on InterCity regional and long distance services with a range of flexible Coach and Ferry Passes, that can be used on InterCity national bus and coach network plus the combined bus and coach networks of Great Sights and Newmans Coachlines and Interislander ferry services between the North and South Islands of New Zealand. 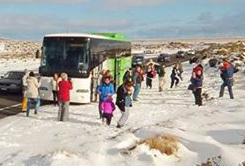 All Coach and Ferry Passes are sold in blocks of 'Travel Hours' or you can choose from a range of pre-planned travel options, allowing you to travel on regular InterCity, Newmans bus and coach services or on any Great Sights sightseeing journeys or a mixture of both, in any direction as many times as you want over 12 months from date of purchase.